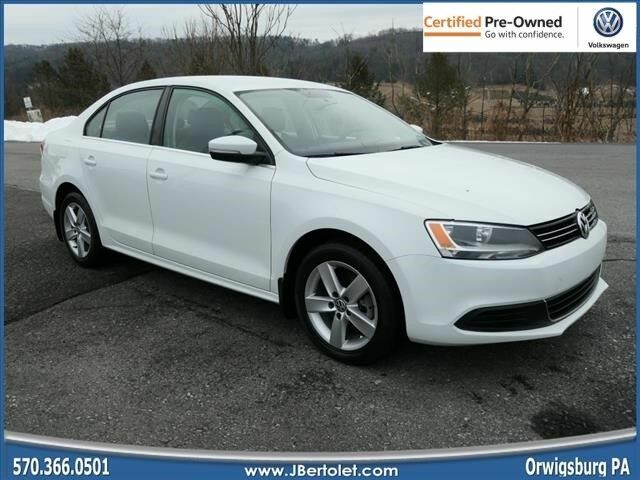 Equipped with a braking assist, stability control, traction control, Sirius satellite radio, a MP3 player, anti-lock brakes, dual airbags, side air bag system, digital display, and airbag deactivation, this 2014 Volkswagen Jetta TDI Value Edition is a must for smart drivers everywhere. This one's available at the low price of $13,500. This 4 dr sedan is one of the safest you could buy. It earned a crash test rating of 5 out of 5 stars. Check out the driving performance on this diesel-engine vehicle. Flaunting a gorgeous white exterior and a titan black interior. Don't sit on this decision for long...schedule your test drive today! Contact Information: J Bertolet Volkswagen, 555 Rt 61, Orwigsburg, PA, 17961, Phone: (570) 366-0501, E-mail: johnbertolet@jbertolet.com.